General economic theory holds that companies will produce more of a good if its price is higher, or if it receives subsidies. Funny that these rules didn’t seem to apply to Big Oil in 2011, when the highest oil price since 1864 and $2 billion in subsidies to the five largest oil companies—BP, Chevron, ConocoPhillips, ExxonMobil, and Royal Dutch Shell—yielded lower oil production than in 2010. 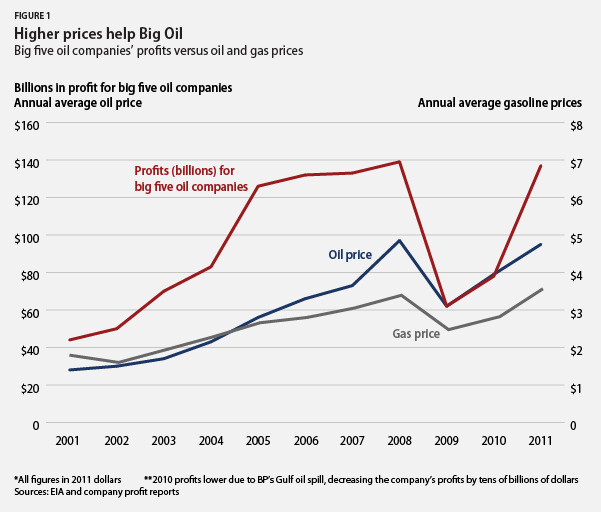 But these five oil companies combined made a record-high $137 billion in profits in 2011—up 75 percent from 2010—and have made more than $1 trillion in profits from 2001 through 2011. This exceeds the previous record of $136 billion in profits in 2008. They produced 4 percent less oil and “oil equivalent” in 2011 compared to 2010. 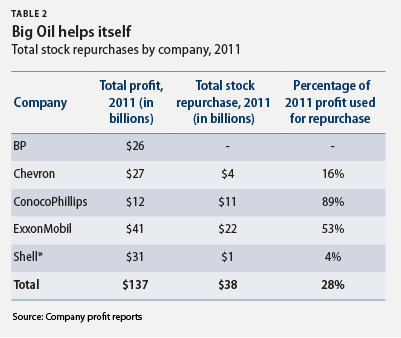 They spent a total of $38 billion, or 28 percent, of their profits to repurchase their own stock. They are sitting on more than $58 billion in cash reserves as of the end of 2011. They spent $1.6 million on campaign contributions and $65.7 million on lobbying efforts. For every $1 spent on lobbying in Washington, the big five received $30 worth of tax breaks. Let’s dig a little deeper into this mystery to see why these companies are making more money while Americans see less oil and pay more at the pump. 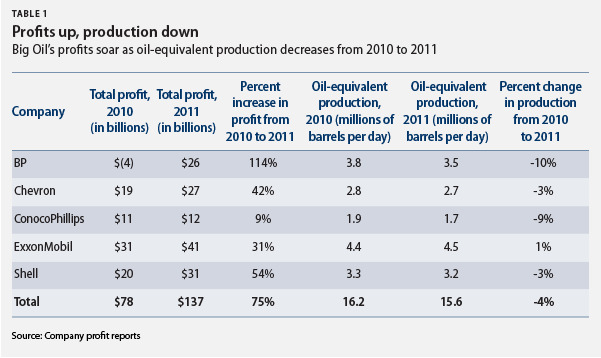 In spite of these high profits and oil prices, oil-equivalent production fell from 2010 levels for four of the big five oil companies. Shell’s profit, for example, increased by 54 percent from 2010 to 2011 while its oil and natural gas production decreased by 3 percent during the same time period. So if the big five companies are not using their additional earnings to increase production, what are they spending their money on? The answer: They’re buying shares of their own stocks and investing in politicians to maintain the policies that led to their enormous profits over the past decade. Instead of heavily investing in job creation or production, the big five used $38 billion, or 28 percent of annual net income, to repurchase their own stocks. This practice enriches shareholders but it doesn’t add to oil supplies or investments in alternative fuels or other new technologies. These companies also cling to tax breaks while maintaining $58 billion in cash reserves. This is nearly 30 times more than the estimated $2 billion in annual special tax breaks that these companies receive. 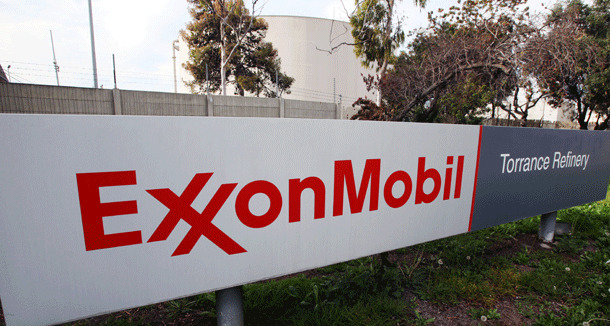 ExxonMobil, the most profitable of the big five, paid an effective tax rate of 17.6 percent (from 2008–2010 data), which is 3 percent less than what the average American family paid. 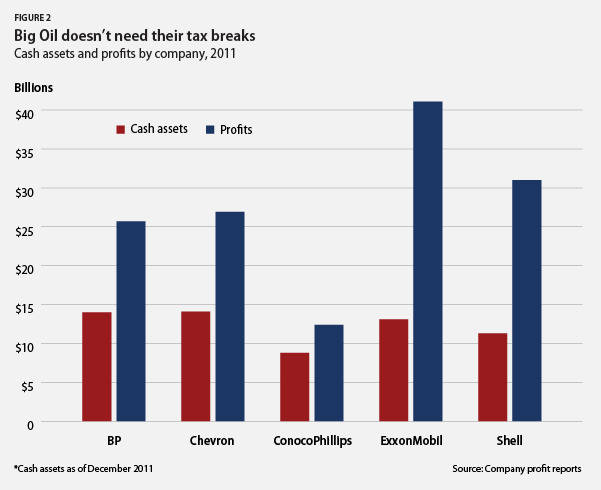 But Exxon and other oil companies that receive these tax breaks do not pass benefits on to consumers. Instead, their board members, executives, and shareholders are the ones that profit. These companies, along with the American Petroleum Institute—their political arm—fight relentlessly to keep their tax breaks intact by threatening economic and energy damage. API claims that eliminating tax loopholes for the oil and gas industry would “lose jobs … and energy production.” Yet higher oil prices and profits, combined with huge reserves and tax breaks, yielded lower, not higher, employment and oil production. Despite generating $546 billion in profits between 2005 and 2010, ExxonMobil, Chevron, Shell, and BP combined to reduce their U.S. workforce by 11,200 employees over that time. The oil and gas industry is a mature and highly profitable sector that is no longer in need of generous tax breaks or royalty free drilling. The $43.6 billion in tax subsidies that the industry is set to receive over the next decade will not help consumers with rising energy costs. One place where oil companies have no trouble spending money, however, is in Congress. Last year the big five spent $65.7 million on lobbying efforts, successfully persuading their congressional friends to retain tax breaks. Both the House and Senate had votes to scale back these tax breaks, and both proposals were defeated. And Big Oil’s lobbying expenditures were quite a bargain. For every $1 the big five spent on lobbying in D.C. last year, they effectively received $30 in subsidies disguised as tax breaks. This is equivalent to a 3,000 percent return on every dollar they invested in strong-arming Congress. 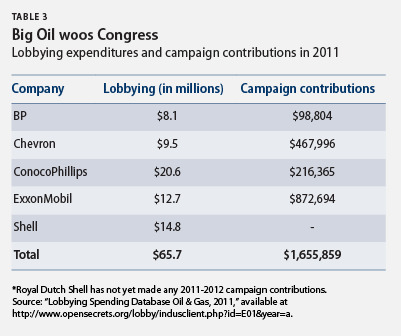 More than $1.6 million was spent on campaign contributions in 2011 from just four of the top five oil companies. And more than 90 percent of these campaign contributions were made to Republican candidates or committees. But that doesn’t even include their undisclosed contributions to the U.S. Chamber of Commerce, the American Petroleum Institute, or other organizations that also support tax breaks for Big Oil. In the spirit of giving, three of the five Big Oil CEOs—Rex Tillerson of ExxonMobil, John Watson of Chevron, and Jim Mulva of ConocoPhillips—contributed an additional $75,000 to GOP candidates and committees. We subsidized oil for a very long time, long enough. It’s time to stop giving taxpayer giveaways to an industry that’s never been more profitable. Seventy-four percent of Americans agree with the president’s desire to eliminate tax breaks for the oil and gas industry. Instead of benefiting oil companies that reward senior executives, board members, and stockholders, these taxpayer funds should be invested in projects that benefit all Americans. A University of Massachusetts study found that investment in clean energy creates anywhere from two to four times more direct and indirect jobs compared to the same investment in oil and gas production. After a year of near-record profits and a decade of more than $1 trillion in total profits, the least the five huge oil companies can do to help our nation is to relinquish their unnecessary and ineffective tax breaks. * Correction, February 7, 2012: The original column incorrectly stated some of the statistics for the change in the big five oil companies’ oil-equivalent production from 2010 to 2011. Daniel J. Weiss is a Senior Fellow and the Director of Climate Strategy, Jackie Weidman is a Special Assistant, and Rebecca Leber is a Research Assistant at American Progress. Special thanks to Gabe Manion and Linda Benesch, who are both interns with the Think Progress War Room. In 2010 BP suffered a net loss of $4 billion due to its huge expenditures related to the BP Deepwater Horizon oil disaster. If BP is excluded from profit calculations in 2010 and 2011, the four remaining companies had a 36 percent increase in profit. On March 1, 2011, the House voted 249-176 to defeat a “Motion to Recommit [that] would repeal oil and tax production tax breaks for major integrated oil companies.” On May 17 the Senate voted 52-48 on a motion to proceed to the Close Big Oil Tax Loopholes Act, S. 940. Sixty votes were required to end debate and proceed to the bill, so it failed.